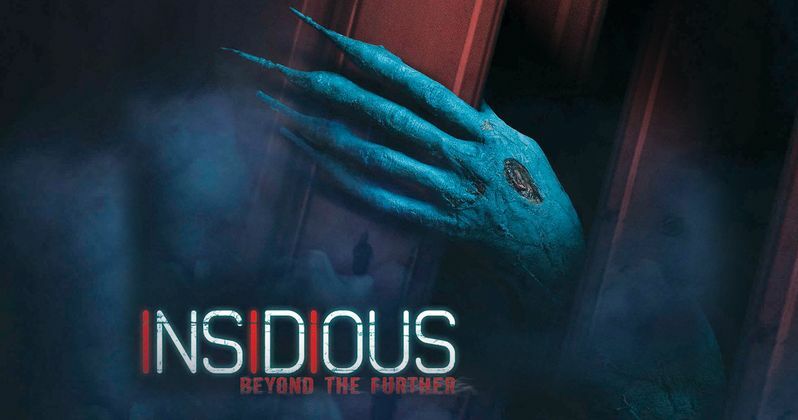 Beginning Friday, September 15, paranormal activity grips Halloween Horror Nights at Universal Studios Hollywood in the all-new disturbing maze, "Insidious: Beyond the Further," inspired Universal Pictures and Sony Pictures' Stage 6 Films upcoming supernatural thriller, Insidious: Chapter 4. The creepy new maze will delve deep into brilliant parapsychologist Dr. Elise Rainier's past, starting with a childhood in which her paranormal abilities emerged...until her mother's untimely death by a demonic entity. Troubled by a lifetime of evil supernatural spirits trapped in the Further-a vacuous netherworld caught between the living and the dead-Dr. Rainier will take guests on an unsettling journey back in time through a portal into the Further...to defy the most depraved and intimidating beings that have tormented her since the 1950s. Opening in theaters nationwide on Friday, January 5, 2018, Insidious 4 is a Blumhouse Production, Oren Peli Production distributed by Universal Pictures domestically and Sony Pictures' Stage 6 Films internationally. Directed by series newcomer Adam Robitel, the supernatural thriller is written by co-creator Leigh Whannell and produced by Insidious series regulars Jason Blum, Oren Peli and co-creator James Wan. The film stars Lin Shaye as Dr. Rainier, who faces her most fearsome and personal haunting yet: in her own family home. Halloween Horror Nights at Universal Studios Hollywood brings together the sickest minds in horror to immerse guests in a living, breathing, three-dimensional world of terror. Featuring an all-new slate of unrivaled film production quality mazes, frightful scare zones and a fully re-imagined Terror Tram experience uniquely themed to today's most definitive horror properties, Halloween Horror Nights will taunt, terrorize and torment guests with spine-chilling haunted attractions as part of Southern California's most extreme Halloween experience. To date, Halloween Horror Nights will also feature the following mazes: American Horror Story: Roanoke, based on FX's critically-acclaimed, Emmy® and Golden Globe® Award-winning television series; The Shining, inspired by the greatest horror film of all time; and Ash vs Evil Dead from the hit cable series based on the cult classic. Will Insidious 4 Slaughter Last Jedi at the Box Office?